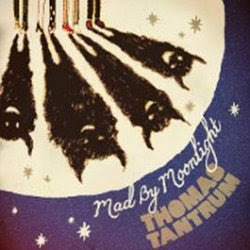 'Mad By Moonlight' is the second album from Southampton based four-piece Thomas Tantrum. It is the successor to their critically acclaimed self titled debut record which came out in 2008. Led by the rather enigmatic Megan Thomas, the group can count pop mistress Lily Allen as a fan, with her appreciative musings surrounding the band’s quirky ‘indie pop’ debut helping to promote the band far and wide. Three years later and with a new drummer (Dave Wade Brown) hopes are high then as Thomas Tantrum unleash their second offering through Stranger Records titled 'Mad By Moonlight'. The bold 'Tick Tock (Satie)' kicks off the record, with the attention quickly being drawn to the vocal prowess of Megan Thomas. It is apparent that her dulcet tones and the band as a whole have been nurtured since that debut album, with the track sounding emphatically gallant in all its pop splendid-ness. Whilst 'Face The Music' and 'Cold Gold' carry on in the same melodic vein, it is the opening single to be taken from the album 'Sleep' that really demonstrates the development this band has taken. Beginning with a Lulu-esque ‘weeeeeeaaahhh’ the band swagger with great conviction as they provide the platform for Thomas to show off her talents, both with her vocal range and the ability to write a hook-laden pop song. 'We Are The People' shows off production virtues of Richard MacNamara, as the infectious vocals are mixed down expertly with the music to create a song which would fit perfectly for one of those hands in the air festival moments. 'Turning Blue' is perhaps my favourite track on the album, showcasing Thomas Tantrum's straightforward blueprint of catchy melodic vocals underpinned by simple yet commanding pop music, with the precision drumming standing out in particular. 'All In Your Head' is almost ballad-like, and like 'Supermodel' has a slower tempo to the other tracks, but both work really well and hint at a tantalising future direction the band may take on later records. 'Mad By Moonlight' is a collection of 12 beautifully rounded pop songs that provide just enough mystery and intrigue to set them apart from their peers, and with Megan Thomas at the helm the band have that special something to help bind everything together. 'Mad By Moonlight' is available to purchase at iTunes, amazon.co.uk etc.